The workshop titled “Pastureland and risk management experiences: key outcomes and further objectives” was organized on 7 March 2012 involving representatives of the Parliament, MOFALI, Agency for Land Relations, Construction, Geodesy and Cartography (ALRCGC), NAMHEM, National Emergency Management Agency (NEMA) and some international donor projects active in pastureland management. Each of 21 aimags was represented by heads of aimag Land Agency, aimag Authority for Food, Agriculture and SME (AFASME) and aimag SLP-II project coordinators. 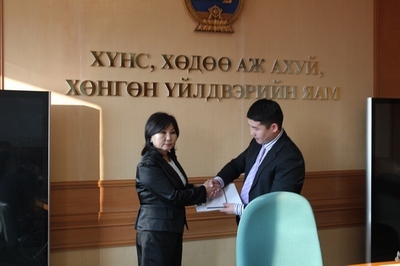 In addition land officers or officer in charge of pastures from soum Veterinary and Breeding Unit (VBU) from demo soums in 8 aimags covered by SLP-I. Copyright © 2018 Бодлого Судлалын төв. All Rights Reserved.